1 » After losing the 1998 governor's race to then-Gov. Ben Cayetano by about 5,000 votes, Linda Lingle comes back with a war chest of nearly $5 million and beats Mazie Hirono by more than 17,000 votes. In her inauguration speech, the Republican declares that Hawaii is "open for business," and pledges to improve the state's reputation in the business world. 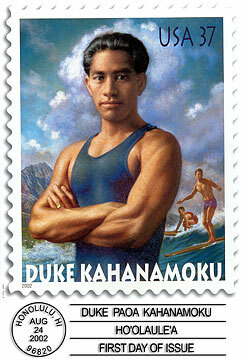 Duke Kahanamoku finally earns a stamp after a long campaign to honor the Hawaiian Olympian. 2 » In the middle of the fall election season, U.S. Rep. Patsy Mink dies, leaving a legacy of unabashed liberalism and a political free-for-all for her office. Mink dies on Sept. 28 after a month-long bout with a viral pneumonia brought on by chickenpox. The longtime Democrat was remembered for many accomplishments in her fight for civil rights for women and minorities, including co-authoring 1972's Title IX of the Education Act, which mandated gender equality in any education program or activity receiving federal financial assistance. A sign warns motorists that speeding is being monitored by cameras in vans parked along major highways. This sign is on H-1 near Kalihi. 3 » Mayor Jeremy Harris drops a political bombshell on May 30. The presumed front-runner for the Democratic gubernatorial nomination, Harris pulls out of the race, citing polls that put him far behind Lingle. 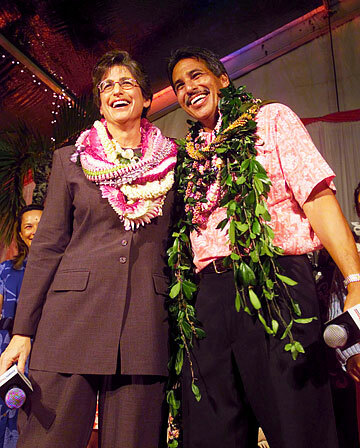 The move negates the need for a mayoral race that already had a field of potential candidates, including Hirono, who immediately jumps back into the gubernatorial race. 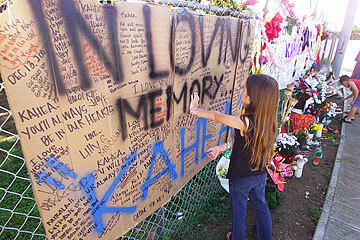 4 » On Dec. 10, 11-year-old Kahealani Indreginal goes missing from her Makalapa housing complex. An intensive police search ends Dec. 13 when her body is found by a hiker off the Aiea Loop Trail. Later that night, police arrest Christopher Clayburn Aki, the 20-year-old boyfriend of the girl's half sister. Aki is charged with second-degree murder. 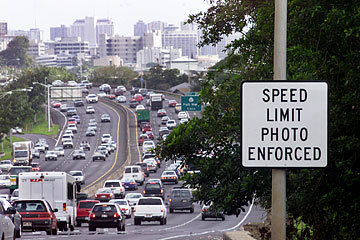 5 » In the first week of 2002, white vans parked along major roadways on Oahu begin taking pictures of speeding vehicles. Tickets are mailed to the cars' registered owners, and a political and legal firestorm ensues. Within a month, Gov. Cayetano puts the program on hold, and by April it is killed altogether. Linda Lingle and Duke Aiona declare victory as the newly elected governor and lieutenant governor, the first Republicans to win the offices in decades. 1 » Labor unrest holds center stage. With a strike now nearly into its second month, nurses from Queen's Kuakini and St. Francis hospitals continue to protest working conditions and benefits. Meanwhile, West Coast dockworkers, locked out by shippers for 11 days in late September and early October, tentatively agree to a contract in November. And Local 5 hotel workers reach contract agreements in September with Waikiki hotels Sheraton, Hilton and Hyatt after several days of selective picketing. 2 » Tourism, the state's top industry, continues to rebound from the terrorist attack fallout with most key economic gauges at or near pre-Sept. 11 levels. Construction and real estate, helped by 40-year-low interest rates, boom. But the recovery also proves uneven, as Japanese tourism continues to lag. 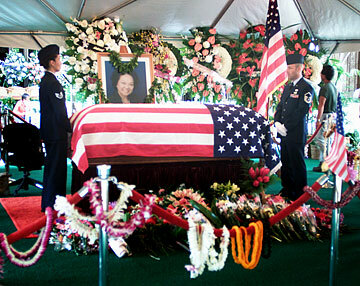 Two honor guards stand watch over the flag-draped casket of Patsy Mink at the State Capitol. 3 » With interest rates hovering at or around 6 percent for much of the year, 2001 turns out to be a record year for home sales. Sales of existing homes on Oahu by the end of November stand at 3,559 single-family homes and 4,919 condominiums -- already exceeding year-end totals reached in 2001. Honolulu's median sales prices also advance, to $347,000 for a single-family home and $160,000 for a condominium. 4 » Hawaiian Airlines and Aloha Airlines start 2002 trying to wrap up a $200 million deal that would merge them into one new airline. 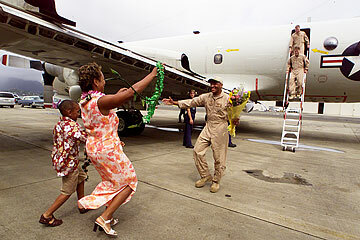 Neither airline has been profitable in the interisland business since Sept. 11 slowed air travel. By mid-March the merger is called off, but in November they are talking again, but only under an antitrust exemption that lets them jointly adjust total interisland capacity so they no longer have half-empty flights. 5 » Ownership in Hawaii's retail business takes another big shift as General Growth Properties Inc., already the owner of the 50-acre Ala Moana Center since an $810 million deal in 1999, agrees to pay $250 million for Victoria Ward Ltd. and its 65 acres of shopping and commercial space. That lifts Chicago-based General Growth's investment in Hawaii shopping centers to well over $1 billion, including the 504,000-square-foot Prince Kuhio Plaza in Hilo. 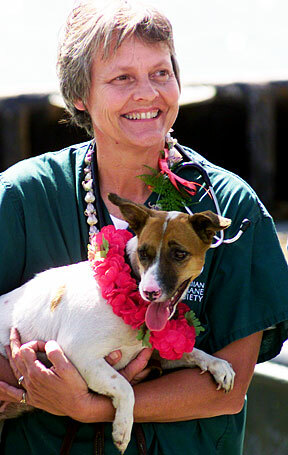 Becky Rhoades, at right, of the Hawaiian Humane Society, holds Hokget for photos aboard the American Quest at Pier 24. The mixed terrier was rescued from a burned out tanker in April. 1 » A Division I level is a major accomplishment no matter what the arena. True, men's volleyball on the national scene is barely visible to the naked eye, but here in Hawaii the sport is king. Last spring's win over top-ranked Pepperdine at Penn State results in the first national title for a men's program at UH. Given the current circumstances, it is unlikely Hawaii will ever win a national title in football, basketball or baseball. 2 » Herman Frazier, hired as UH athletic director, is attempting to fix problems in the department in part by raising the athletic department budget by as much as $2 million. His close ties to the Olympics give Frazier the ability and know-how, but there are many problems on the horizon, chief among them improving attendance for all major sports and finding a way to sign June Jones to a long-term contract. 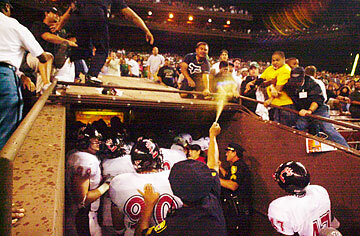 A police officer sprays pepper spray at rioting fans as University of Cincinnati football players exit Aloha Stadium after the University of Hawaii's 20-19 win. Players from both teams scuffle for about five minutes after the game before order is restored. 3 » Despite losing to Tulane in the Hawaii Bowl, the Hawaii football team has a stellar season. The Warriors win 10 games, including a huge road victory over Fresno State. They also come close to knocking off Brigham Young on the road and nationally ranked Alabama at home. 4 » A team from Waipio goes to Williamsport, Pa., and the Little League World Series. In doing so, it captures the hearts and minds of nearly every baseball fan in the 50th state. The team fails to advance out of the round-robin format but does win one game, defeating a team from Worchester, Mass., 3-2 on a home run by Travis Jones. 5 » For the second season in a row, UH head coach Riley Wallace leads his men's basketball team to the NCAA Tournament. Unfortunately, the Rainbows fail to advance out of the first round for a second consecutive time. The 2003 squad is looking for a March Madness trifecta. Only this time, the Rainbows want to get to the second round and beyond. It's a long shot, but don't count out Carl English and Co. They have a way of getting things done. 1 » Hollywood comes to Hawaii in June as Tia Carrere, Daveigh Chase and Jason Scott Lee stroll the red carpet with hundreds of movie lovers for Consolidated Waikiki Twins' premier of Disney's animated film "Lilo & Stitch." 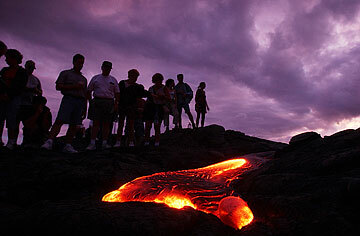 The animated film was inspired by Kauai, and its appeal has been international, generating some $250 million in ticket sales. 2 » Janet Jackson's "All for You" Concert is Hawaii's biggest concert of the year. It is also much better overall than her 1998 "Velvet Rope" concert. The most memorable concerts headlined by local stars are the Brothers Cazimero 25th Annual May Day Concert at the Waikiki Shell, Cecilio & Kapono at Kapono's in August, Keola Beamer with Matt Catingub and the Honolulu Symphony in November, and Willie K at Kapono's in December. 3 » It takes more than 30 years from concept to reality, but the Hawaii State Art Museum debuts Nov. 3 with a collection other states will envy. HISAM was created to be the permanent home of some 5,000 works of art by 1,400 local artists that form the state's "Art in Public Places" collection. About 360 works are chosen for the inaugural exhibition, "Enriched by Diversity -- The Art of Hawai'i." 4 » The Dec. 6 opening of 2100 Kalakaua provides the dress-up party of the year as Honolulu's best dressed prove there is a place for fashion even in a place where weather dictates a uniform of T-shirts and shorts. The grand-opening celebration for Boucheron, Chanel, Gucci, Tiffany, Tod's and Yves Saint Laurent is marked by models, champagne, a visit by Paloma Picasso and a free concert by Al Green. 5 » Local author Takashi Matsuoka's "Cloud of Sparrows" makes news around the world as it ventures into epic samurai territory. Set at the end of the Tokugawa era, the ways of the samurai are disappearing, and Matsuoka plays with the dueling concepts of fate and destiny though a Hollywood-ready mix of characters.